Now available in large 680 x 440mm size. Chamois made from PVA are not all created equal. Like most materials there are different grades, quality and characteristics. Our superior construction doesn’t grab or stick to paintwork thereby significantly reducing the chances of trapped dirt particles being dragged across the finish. It also leaves the surface free of wipe-off marks or streaks. HOW TO USE: Before first use, soak in Meguiar’s car wash solution for a few minutes. Then rinse well with cold water and wring-out excess. 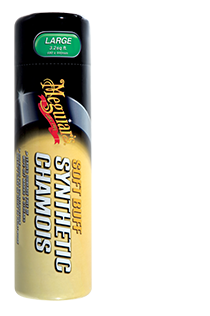 Where possible, instead of using a rubbing action, open the chamois to full size and lift leading portion by holding two corners, then pull across surface. *ALWAYS READ FULL DIRECTIONS PRINTED ON THE PRODUCT PRIOR TO USE.